Chiang Mai Fest this weekend! in for free rabies vaccinations from April 7-May 24. 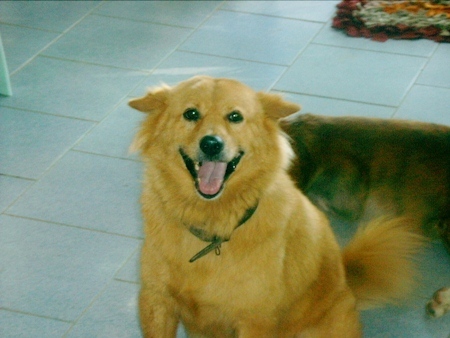 Chiang Mai Municipality is providing rabies vaccinations for pets in order to help the spread of rabies. In addition to the rabies vaccination, shots for getting rid of ticks and fleas and birth control will be on offer. However, the birth control shots are a temporary measure and pet owners should get their pets sterilized. Chiang Mai Mayor Tussanai Buranupakorn said this is a public service to help prevent the spread of rabies. Rabies becomes more prevalent in the hot summer season and so the Municipality is working aggressively to fight the spread of the disease. Veterinarians are offering services under the project launched by Office of Public Health and Environment. The Veterinary staff provides the vaccination services to pets in the municipal area from now until May 24, from 4.30 p.m. – 8.30 p.m.
William Marcus Young II was a long term resident of Chiang Mai and helped to establish a Lahu Foundation and Coordination Center to solve issues of drugs, poverty, and civil rights within the tribal community. Bill Young was born in Berkeley, CA, USA in 1934 and died in Chiang Mai on April 1, 2011. The third generation of a Baptist missionary family, Bill spent his childhood years in the mountains of Taunggyi, Burma among the Lahu and Shan hilltribes. Bill’s family escaped to India during World War II where his father and uncle both served in the Allied effort developing tribal intelligence networks throughout China, India and Burma. The family returned to South East Asia after the war to live in Chiang Mai where Bill became fluent in English, Thai, Lahu, Shan and some Chinese. Bill enlisted in the U.S. Army at the age of 19 where he was deployed to Germany during the Hungarian revolution. Bill’s father and older brother were recruited by the CIA at this time, to develop a network of Lahu and Shan intelligence teams in Burma and Southwestern Thailand. Bill returned to Thailand at the age of 24 to work with the CIA and American Colonel William Lair and General Vang Pao of the Royal Lao Army to train anti-communist Hmong guerillas in unconventional warfare. Bill established a headquarters in the mountainous region of Northwest Laos in 1962 to recruit leaders of the Lahu, Lao, Akha, Hmong, Khmu and other groups into a tribal council working together to stem the incursion of communists into the region. He convinced dozens of disparate groups to work together, earning commendations from the CIA and local ethnic groups. Bill retired from the CIA to return to Thailand to work with archaeologist Dr. Chester Gorman excavating spirit caves in Mae Hong Son and Kanchanaburi. He then worked in Vietnam as a security advisor for a construction company and Chevron in the Sudan. He returned to Thailand in the late 1980’s to establish Golden Triangle Tours where his extensive local knowledge and language skills guided high profile visitors around the region. In his final years he established the foundation to help the Lahu people, never forgetting his roots in Burma. Mr. Young is survived by five children and two grandchildren. The funeral was held April 6, 2011 at the Foreign Cemetery. Mayor Tussanai Buranupakorn is joined on stage by the head of the TAT, Chalermsak Suranant, sponsors and others in announcing the schedule of events for the Songkran Holidays. One of the best places to experience Songkran is in Chiang Mai, where it is celebrated on a grand scale with a flavor uniquely and entirely its own, attracting visitors from far and wide. This year, Songkran Thai New Year festivities scheduled for April 11-15, 2011 will be held all around Chiang Mai, at temples, in the vicinity of the city’s gates and around the city moat. Devout Buddhists visit the temple for merit-making and to listen to sermons. Lustral water is sprinkled on sacred Buddha images, such as the Phra Puttha Sihing image, and also poured over the hands of monks in a gesture of reverence. Donations are also made to the temple. One of the highlights of the festival is the 'Songkran Beauty Queen Procession' that takes place on Songkran Day itself — April 13. Meanwhile, many other events leading up to the main attraction are spread over several days and it is here that the visitor gets to see various aspects of Chiang Mai, first hand, — its culture, cuisine, arts and crafts, as well as the friendly people. Chiang Mai Municipality announced the Songkran schedule on March 31 at Thapae Gate grounds. Mayor Tussanai Buranupakorn said this year, the Thai traditional New Year celebration in Chiang Mai will be held April 11-15, 2011. He also asked for cooperation from the public and tourists alike not to drink alcohol as part of the alcohol free campaign, especially along the city moats, Thapae road, Ratchadmanoen road, Huay Kaew road, and others. 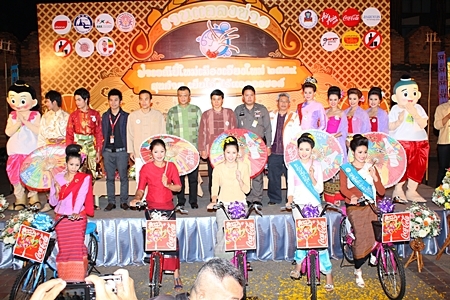 Mayor Tussanai also asked locals to help promote and preserve the great Songkran Lanna tradition and its activities by dressing in traditional Northern clothes and remembering to use the unique Northern dialect or ‘Kham Muang’ during the festival. Songkran water-splashing around the ancient city moat. Local Lanna arts and handicraft shows 5.00 p.m. 11.00 p.m. April 3, April 10 at the Ratchadamnoen walking street. Holy water bathing ceremony 9.00 a.m. – 10. p.m. April 7 -9, at Wat Chiang Yuen. Sand pagoda/ chedi building, holy water bathing ceremony, local arts and Tung flag contests. 10.00 a.m. – 9.30 p.m. April 10-15 at Wat Chedlin. Holy water bathing ceremony. 9.00 a.m. – 10.00 p.m. April 11-15, at Wat Phan-on. Celebration, morning market, Thai and local singing contests, local arts shows; 8.00 a.m. – 11.00 p.m. April 11-15 at Wat Phrasing. 715th years anniversary of Chiang Mai city, cultural road with local people, international food. 5.00 p.m. – 11.00 p.m. April 11-15 at Thapae gate grounds, Klangwieng intersection. City’s 715th anniversary celebration, merit making ceremony. 6.00 a.m. – 8. 00 a.m. April 12 at Three Kings Monument. Shrine/spirit house ceremony; 08.09 a.m. - 08.39 a. m. April 12 at Chiang Mai Municipality. Three Kings spirits ceremony; 09. 09 a.m. – 10. 09 a.m. April 12 at Three Kings Monument. Maha Songkran ceremony; 10. 30 a.m. - 11.39 a.m. April 12 at Chiang Mai Municipality. Dum Hua offerings parade, paying tributes/ respects to Three Kings spirit: 4.00 p.m. – 6.00 p.m. April 12 at Three Kings Monument. Songkran Celebration: City moat roads April 12-15. Lanna land and arts exhibitions; 9. 00 a.m. – 9.00 p.m. April 12 -15 at Wat Inthakhin City Pillar. Holy water bathing ceremony, sand pagoda building, local arts shows 9..00 a.m. – 10.00 p.m. April 12 -15 At Buddha Sathan. Traditional Thai new year celebration, holy water bathing ceremony; 6. 00 a.m. – 8.00 p.m. April 12- 15 at Wat Lokmolee. Merit making ceremony on the Thai New year day: 6.00 a.m. -8.00 a.m. April 13 at Thapae gate. Mae Ying Keerod Theep Kang Jong parade contest (young women holding umbrella and driving bicycles in procession), Thai Lanna in the Past fair: 7.00 a.m. – 12.00 p.m. April 13, at TAT’s Chiang Mai Office, Thapae Gate. Grand opening ceremony of Songkran Chiang Mai: 8.09 a.m. – 8. 39 a.m. April 13 at Thapae Gate. Lanna offerings contest: 8.30 a.m. – 12.00 p.m. April 13 at Thapae Gate. Invitation ceremony for the Buddha Sihing image to be housed and carried on the Bussabok carriage; 9.09 a.m. – 09. 39 a.m. April 13 at Wat Phrasing. Invitation ceremony for the Buddha Sihing, Buddha images and Miss Songkran on floats in the grand parade; 5. 30 p.m. - 6.00 p.m. April 13 at Sanpakoi intersection, Wat Phra sing. Culture road; 10 .00 a.m. – 10.00 p.m. April 13-15 at Nawarat Bridge, Governor’s residence. Sand carrying ceremony and parade: 3.00 p.m. – 5.00 p.m. April 14 at Kua Lek (Iron) Bridge, temples on Thapae road. Tomoharu Abihara, the Director of Thai-Japan Education Development Foundation (TJEDF) said on April 1 that the Foundation had received over half a million baht to the their bank account, all funds go to help those in Miyagi Prefecture. Additionally, 350 bags of donated goods had been given to the Foundation by the Chiang Mai Chamber of Commerce and business operators in Chiang Mai, ARS D-SINE CO., LTD and Sain S Souvenir Co. The Chiang Mai Provincial Authorities donated flashlights for the victims. Tomoharu Abihara noted that the donated goods were sent to Japan on April 1 via Thai Airways International and noted that Customs would be exempting tax on the donated items. The donated items were forwarded to Prof. Madaki Manabe, the Foundation’s representative in Tokyo and then Prof. Manabe will send these items next week to Miyagi Prefecture which was devastated in the tsunami. Donations were made to Siam Commercial bank’s Chiang Mai University branch for Thai-Japan Education Development Foundation bank account number 667-276922-2. For more information please contact Tomoharu Abihara, the director of Thai-Japan Education Development Foundation (TJEDF). http://tjedf.com/. [email protected] 081-972-9863. 87/187 Moo 12 Tambon San Kamphaeng, San Kamphaeng district, Chiang Mai 50130. The two suspects with the haul of Yabaa pills at the police station. A former soldier and Lisu hill tribe man was arrested with his girlfriend after he was caught attempting to deliver 12,000 yabaa pills to dealers in Chiang Mai theChiang Dao police reported. The Lisu hill tribe man, accompanied with his girlfriend, was paid 30,000 baht to deliver the drugs, Pol. Maj. Gen. Somsak Chanthaping, Commander of the Chiang Mai Provincial Police said, noting that Chiang Dao police were acting on a tip off when they stopped the suspect’s pickup truck for a search at the checkpoint on the Chiang Mai- Fang road. The police found the drugs hidden in a toolbox and detained the two suspects for further questioning. The suspect, Wichai Suayja, 27, told the police it had been the first time he had delivered drugs to Chiang Mai and that they had planned to hand the drugs over to a dealer in Chiang Mai. The police charged the pair with possession of drugs with the intent to sell.